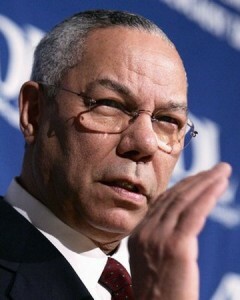 I am a big fan of Colin Powell and whenever he does an appearance/interview I try to watch; and his appearance on Meet The Press Sunday was not a disappointment for me. Colin Powell does not shy away from the fact that he is a Republican but at the same time he is not shying away from expressing his disappointment in the party he grew up with. I will say that I believe that the term minorities is no longer a term to be identified with a particular race but it’s more about economic status. The 47% that Mitt Romney spoke about leaving behind is more than just Black people, it’s made up of low-income folks struggling to stay above water. This is the group of people that so-called conservatives have forgotten. The GOP will have to get it together if they stand to have a chance in 2016.